The red-state Democrats who are up for re-election in November are in a no-win situation over Brett Kavanaugh's Supreme Court nomination — and Tuesday's protests at his confirmation hearing didn't help. Why it matters: The progressive base is demanding that Democratic senators vote no on Kavanaugh. But Republicans say support for his nomination is highest in four Trump states with Democratic senators: Montana, West Virginia, North Dakota and Missouri. Driving the news: Democratic Sen. Kamala Harris interrupted Kavanaugh’s confirmation hearing seconds after it started. Sens. Richard Blumenthal and Cory Booker followed. Protestors were ushered out of the room. Be smart: This is a high-profile vote right before the election that will show voters where these Democratic senators stand — and that will become baggage, whichever way they vote. 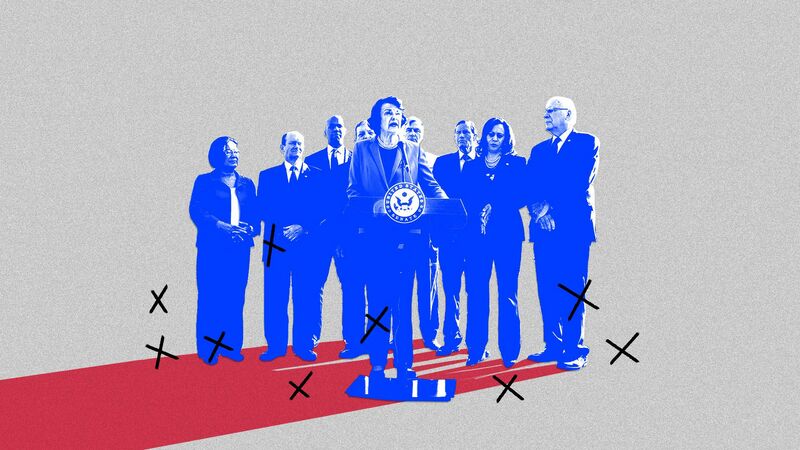 Republicans are determined to make this a midterm election issue by tying vulnerable moderate Dems to their "far-left," "obstructionist" colleagues like Booker and Harris. Just look at the latest ad from Matt Rosendale, the Republican challenging Democratic Sen. Jon Tester in Montana. "Tester opposed Justice Neil Gorsuch, Trump's pick, but Tester voted 99% of the time for Obama's judges." The bottom line: Red-state Democrats are stuck between support for Kavanaugh in their home states and pressure from their party to oppose Trump nominees at all costs. Opposing Kavanaugh might be an easy call for the rest of the Democrats, but it's not an easy call for them.